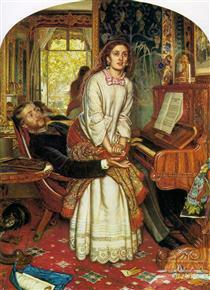 William Holman Hunt OM (2 April 1827 – 7 September 1910) was an English painter and one of the founders of the Pre-Raphaelite Brotherhood. His paintings were notable for their great attention to detail, vivid color, and elaborate symbolism. These features were influenced by the writings of John Ruskin and Thomas Carlyle, according to whom the world itself should be read as a system of visual signs. For Hunt it was the duty of the artist to reveal the correspondence between sign and fact. 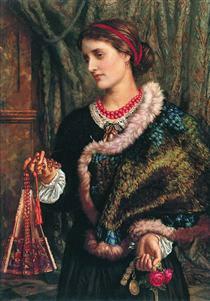 Of all the members of the Pre-Raphaelite Brotherhood, Hunt remained most true to their ideals throughout his career. He was always keen to maximize the popular appeal and public visibility of his works. 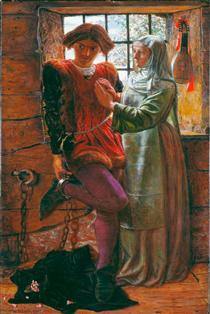 William Holman Hunt changed his surname from "Hobman Hunt" to Holman Hunt when he discovered that a clerk had misspelled the name after his baptism at the Anglican church of Saint Mary the Virgin, Ewell, England. After eventually entering the Royal Academy art schools, having initially been rejected, Hunt rebelled against the influence of its founder Sir Joshua Reynolds. 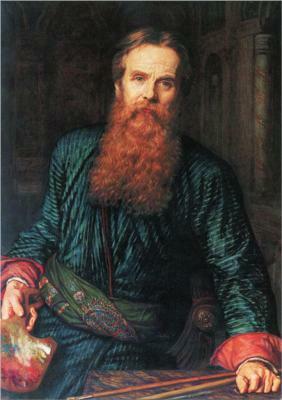 He formed the Pre-Raphaelite movement in 1848, after meeting the poet and artist Dante Gabriel Rossetti. Along with John Everett Millais they sought to revitalise art by emphasising the detailed observation of the natural world in a spirit of quasi-religious devotion to truth. This religious approach was influenced by the spiritual qualities of medieval art, in opposition to the alleged rationalism of the Renaissance embodied by Raphael. He had many pupils including Robert Braithwaite Martineau. Hunt married twice. After a failed engagement to his model Annie Miller, he married Fanny Waugh, who later modelled for the figure of Isabella. When she died in childbirth in Italy, he sculpted her tomb at Fiesole, having it brought down to the English Cemetery in Florence, beside the tomb of Elizabeth Barrett Browning. He had a close connection with St. Mark's Church in Florence, and paid for the communion chalice inscribed in memory of his wife. His second wife, Edith, was Fanny's sister. At the time it was illegal in Great Britain to marry one's deceased wife's sister, so Hunt travelled abroad to marry her. This led to a grave conflict with other family members, notably his former Pre-Raphaelite colleague Thomas Woolner, who had once been in love with Fanny and had married Alice, the third sister of Fanny and Edith. Hunt's works were not initially successful, and were widely attacked in the art press for their alleged clumsiness and ugliness. He achieved some early note for his intensely naturalistic scenes of modern rural and urban life, such as The Hireling Shepherd and The Awakening Conscience. However, it was for his religious paintings that he became famous, initially The Light of the World (1851–1853), now in the chapel at Keble College, Oxford, England; a later version (1900) toured the world and now has its home in St Paul's Cathedral, London, England. In the mid-1850s Hunt travelled to the Holy Land in search of accurate topographical and ethnographical material for further religious works, and to employ his “powers to make more tangible Jesus Christ’s history and teaching”; there he painted The Scapegoat, The Finding of the Saviour in the Temple, and The Shadow of Death, along with many landscapes of the region. 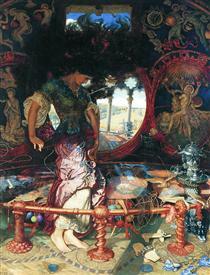 Hunt also painted many works based on poems, such as Isabella and The Lady of Shalott. He eventually built his own house in Jerusalem. Fishingboats by Moonlight William Holman Hunt ?